Readers of the 25th December 1880 issue of the London Illustrated News were treated to a seasonal gift – a full-page account of the mysteries of an English Christmas, as drawn by a Japanese artist. Its highlights include a Christmas pantomime, rendered in kabuki style, an impressionistic rendering of the making of a Christmas pudding, two solitary bachelors dining alone and an old lady with her cat; a children’s Christmas party and a family knees-up, ending in the final panel with the family hungover and the worse for wear, visited by a disapproving doctor. It’s the location of this panel in the lower right corner that gives the game away. Surely a real 19th-century Japanese artist would have imagined a Christmas tableau that ran from right to left? Nobody explained who “Kru-shan-ki” was, but the arch tone of the article that introduced him for the first and only time to readers of the Illustrated London News implied that he didn’t exist at all. 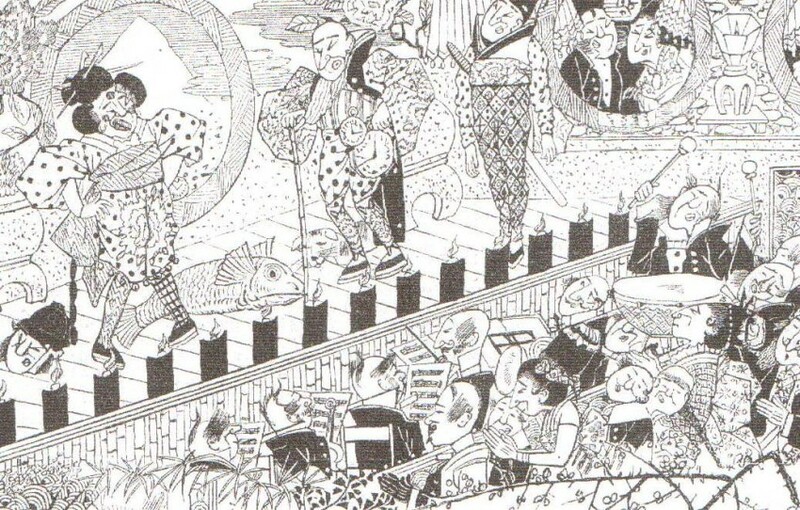 Instead, Kru-shan-ki’s account of an English Christmas, supposedly based on the addled recollections of local ex-pats, may well be the first true pseudomanga – a work purporting to be Japanese, but actually drawn by a Western artist. Japan and the Illustrated London News – Complete Record of Reported Events 1853-1899 is published by Global Oriental.